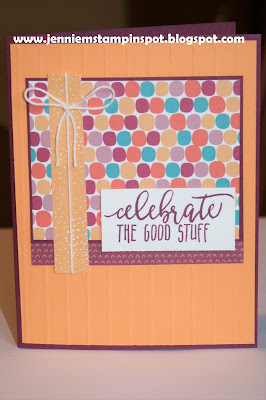 Goodbye to the Celebration Time stamp set and coordinating Celebration Thinlits, I will miss you! And I'll also miss the Picture Perfect Party DSP! The sketch is from The Paper Players#395 here. Today is the last day you can order from the 2017-2018 Catalog. 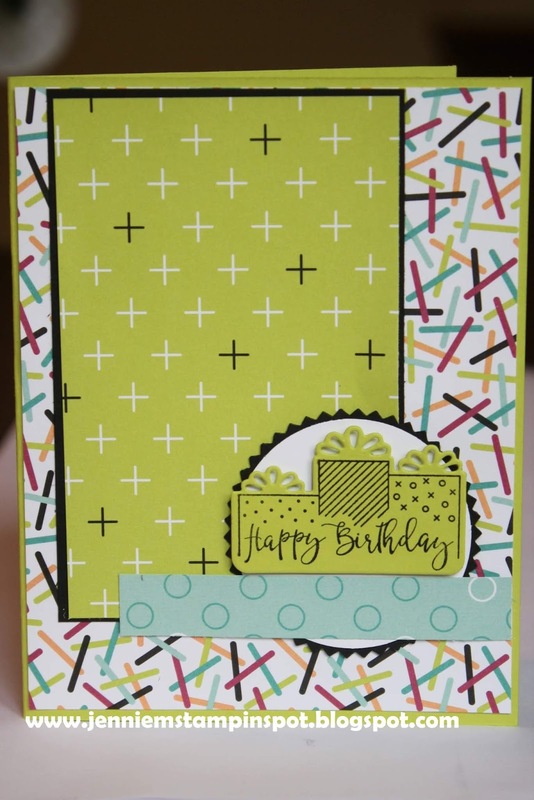 This card uses my favorite stamp set and papers from the retiring Occasions Catalog- Fruit Basket and the Tutti-frutti DSP. 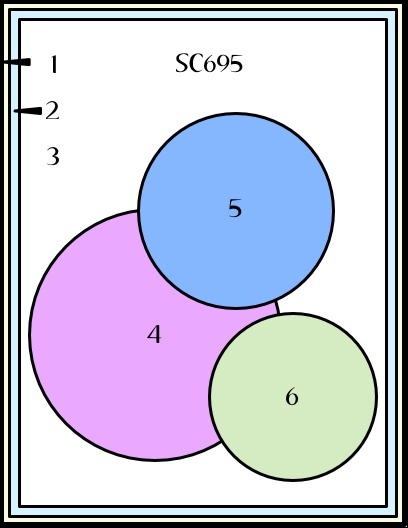 I also used the Freshly Made Sketch#339 here. And the embellishments are going to retire too-Regals Enamel Shapes and the Tutti-frutti Adhesive backed sequins. 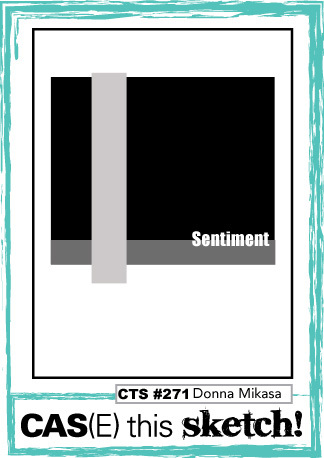 This is my take on this week's Global Design Project#140 here. 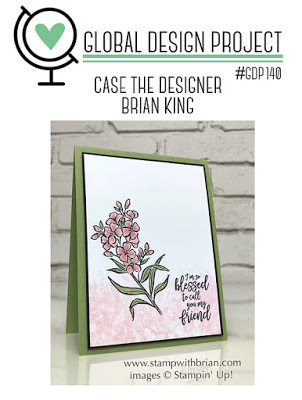 It's a CASE the designer, Brian King. 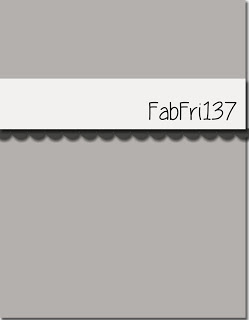 I love his work and check his blog daily! I chose to case both the colors and the layout of Brian's card. I used the Sprinkles of Life stamp set which is going to retire in a few days. I also used a couple of retiring ink colors: Chocolate Chip, Wild Wasabi, Pink Pirouette and Rose Red. 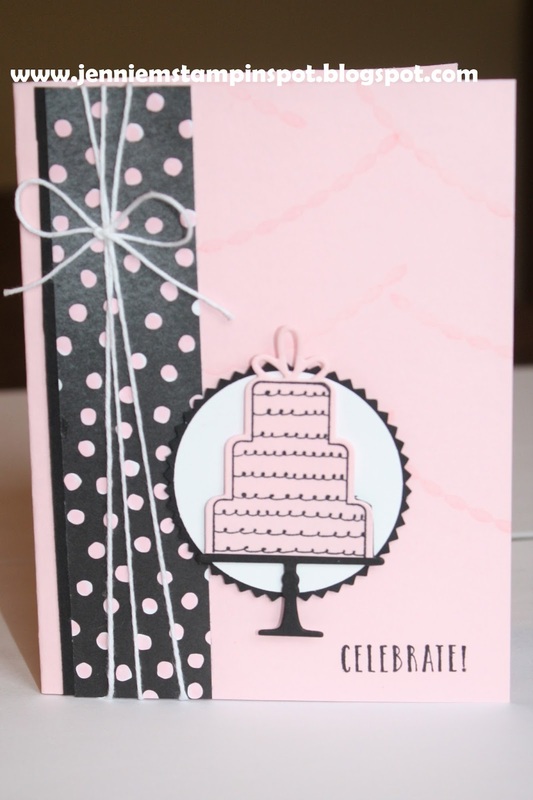 I had to use Confetti Celebration for this card as it's going to retire, and I love it and will miss it! I made it for the sketch at Case This Sketch#273 here. 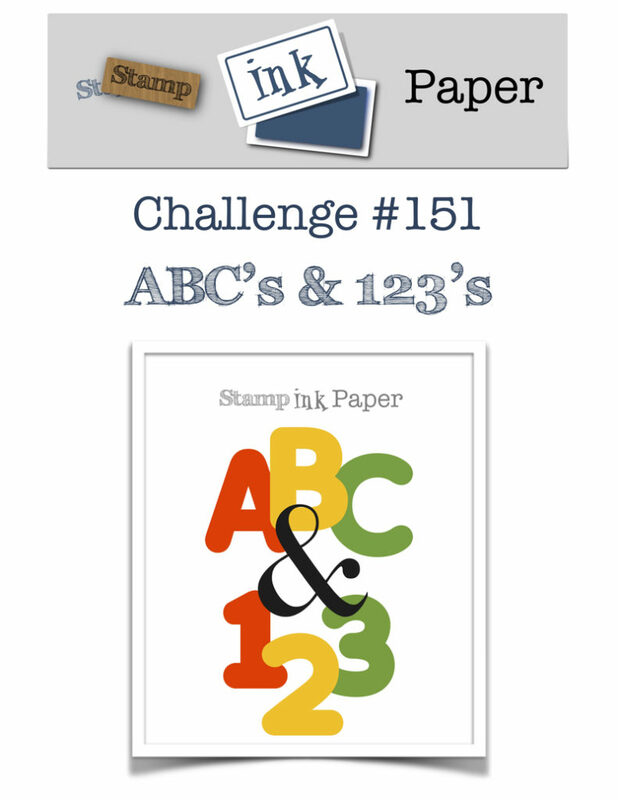 And this qualifies for the Stamp Ink Paper #151-ABC's and 123's, here. 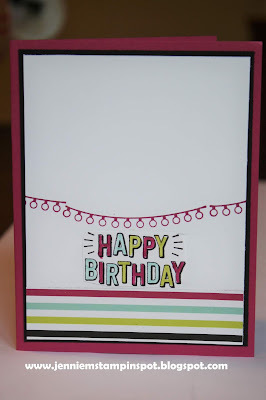 I also used a bit of the retiring Picture Perfect Party DSP. 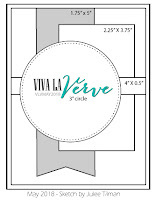 The new catalog goes live a week from today so I had to play with some new goodies. Love What You Do is the stamp set with some coordinating Share What You Love Specialty DSP. 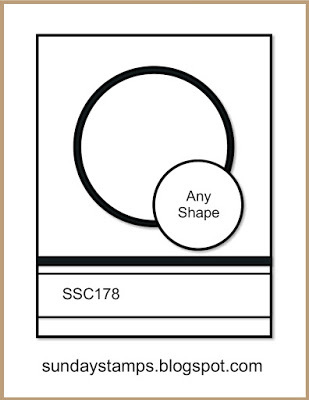 The only thing not new on this card is the two Metallic Enamel Shapes, which are sadly retiring! 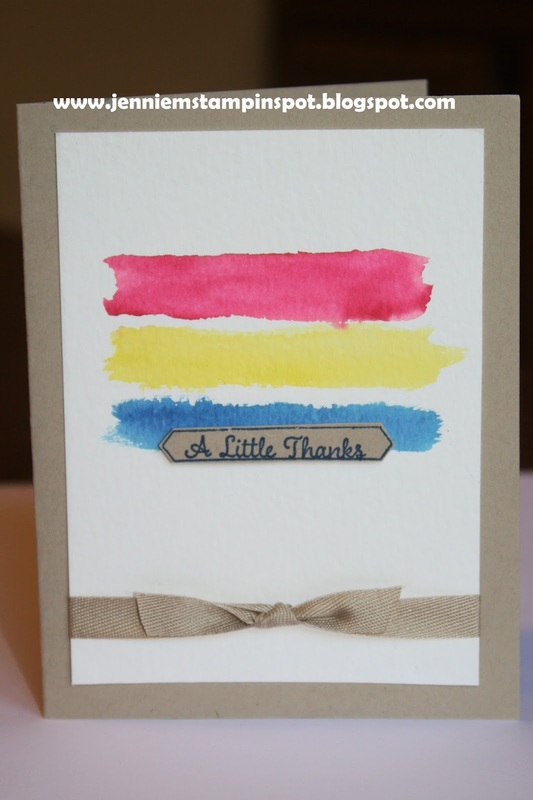 This thank you uses the Freshly Made Sketch#338 here. 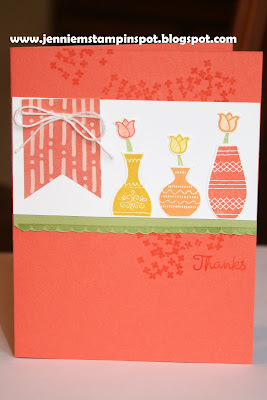 This card has lots of retiring goodies on it! It's also for two challenges. First, the colors are for Hand Stamped Sentiments#290, here. 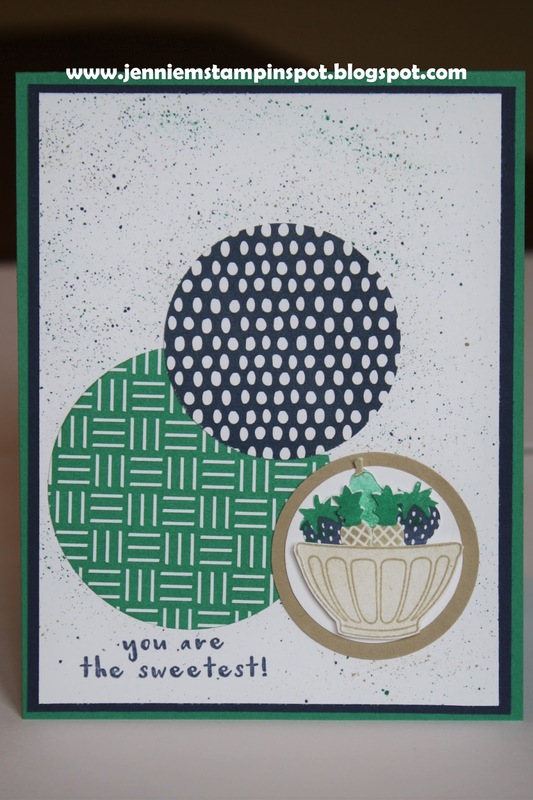 The colors to use are Old Olive, Rich Razzleberry and Marina Mist. 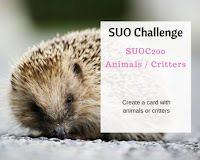 Second, it qualifies for the SUO Challenge#200: Animals and Critters, here. I'd consider a butterfly a pretty critter! 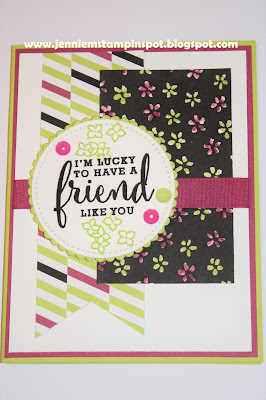 Sharing Sweet Thoughts is the stamp set with some Color Theory DSP, both retiring. 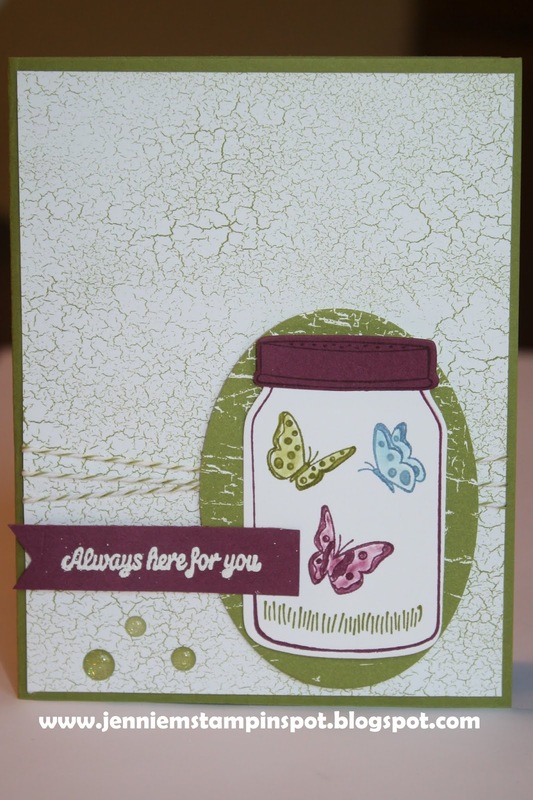 And the Old Olive Baker's Twine and Glitter Enamel Dots are also retiring, as is the color, Marina Mist. 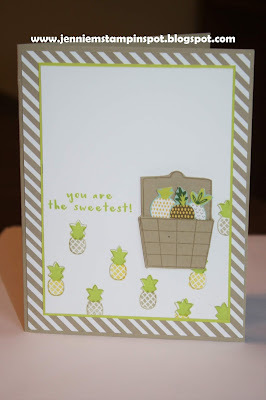 I had to use the Fruit Basket stamp set and coordinating Tutti-frutti DSP again before they retire! 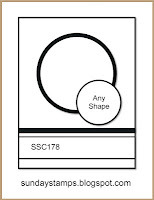 I also used the Case this Sketch#272 here. This card features a few of the new In Colors: Lovely Lipstick, Pineapple Punch and Call Me Clover. 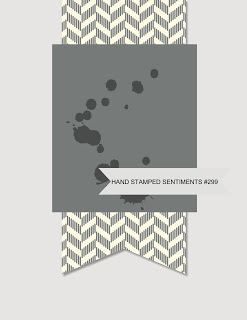 And there's a new stamp set, Itty Bitty Greetings. It's the new Teeny Tiny Wishes. Also, it's also for two challenges. 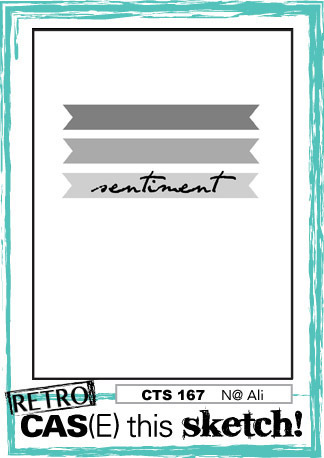 First, the sketch is for Hand Stamped Sentiments#289, here. 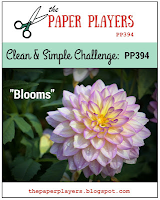 Second, it qualifies for The Paper Players#394-Clean & Simple Challenge: Blooms, here. 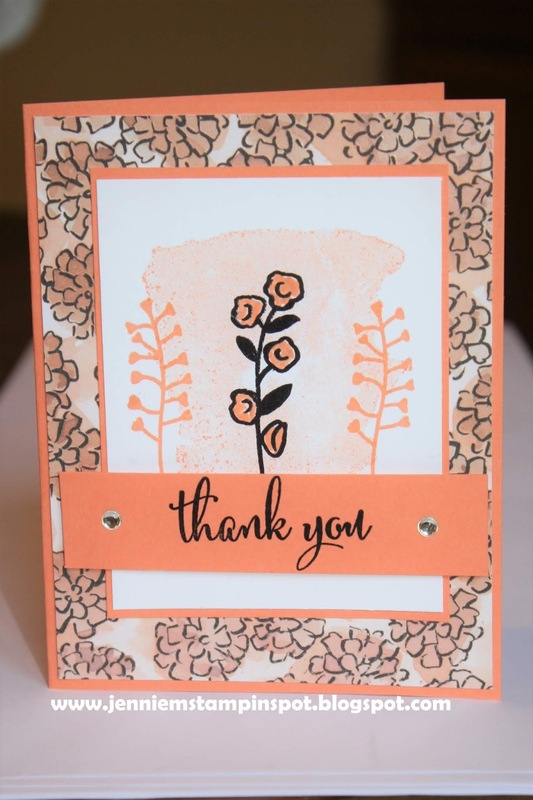 The Lots of Love stamp set was used for the flowers and leaves and I stamped some Pineapple Punch with the little dots stamp from the Waterfront stamp set. 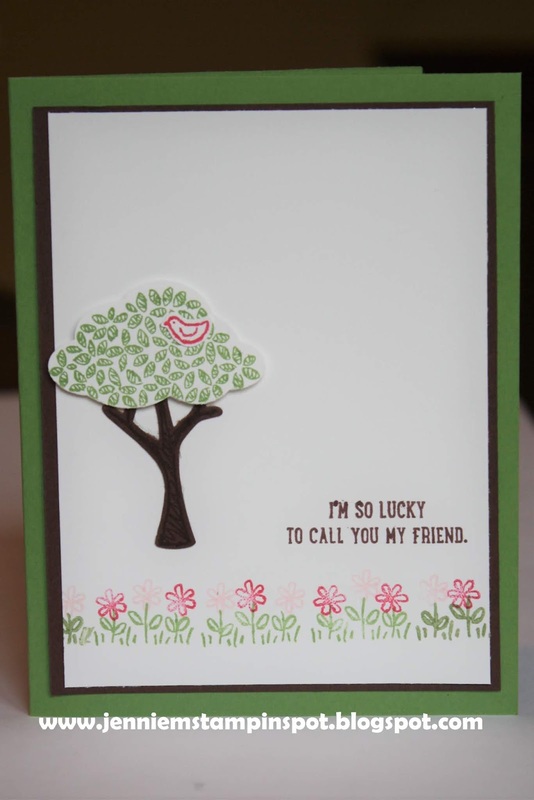 Finally, the greeting is from the new stamp set, Itty Bitty Greetings. 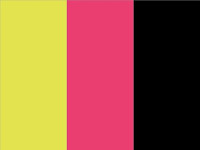 Lastly, the Lovely Lipstick DSP is from the 2018-2020 In Color 6 x 6 DSP. 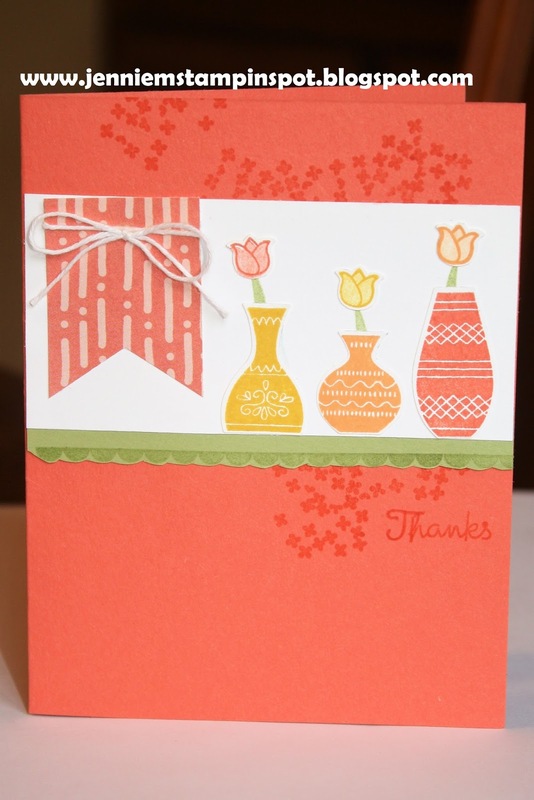 This card uses a new catalog stamp set and coordinating punch: Varied Vases and Vases Builder punch. The sketch is for the Global Design Project#138 here. 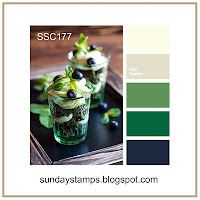 And the colors are for the Splitcoast Color Challenge#687 here. 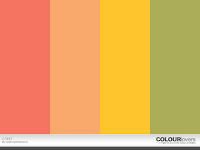 The colors to use are Calypso Coral, Peekaboo Peach, Crushed Curry and Pear Pizzazz. I used the Case this Sketch#271 here for this bright card. 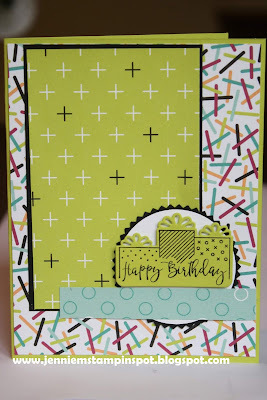 Picture Perfect Birthday is the stamp set with a three patterns from the Tutti-frutti DSP. Can I say, again, how much I will miss this DSP?!?! 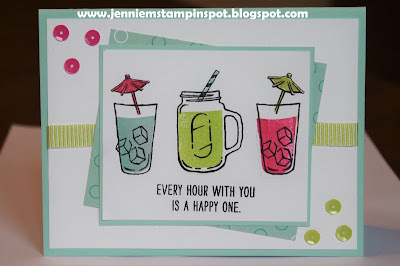 One of my favorite stamp sets, Mixed Drinks, is going to retire so I had to use it for this card. I also had to combine two challenges for this one, again! First, it's for the sketch at Freshly Made Sketches#336 here. 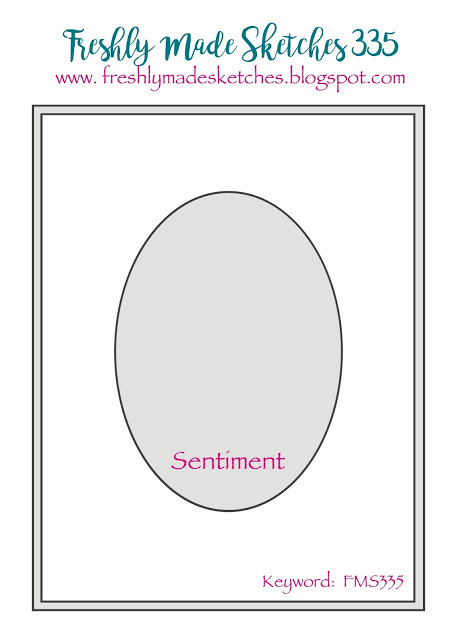 I just flipped the sketch for my card. 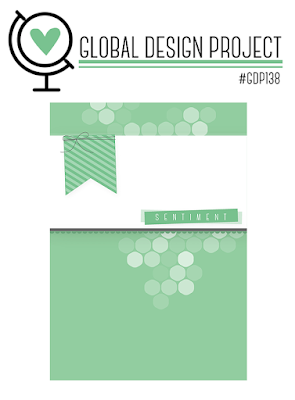 And then I used the Global Design Project#137, here. 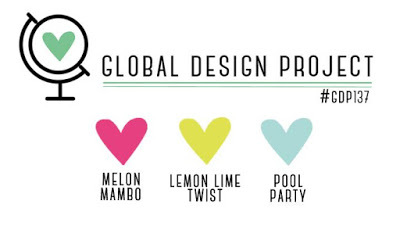 It's a color challenge to use Melon Mambo, Lemon Lime Twist and Pool Party. 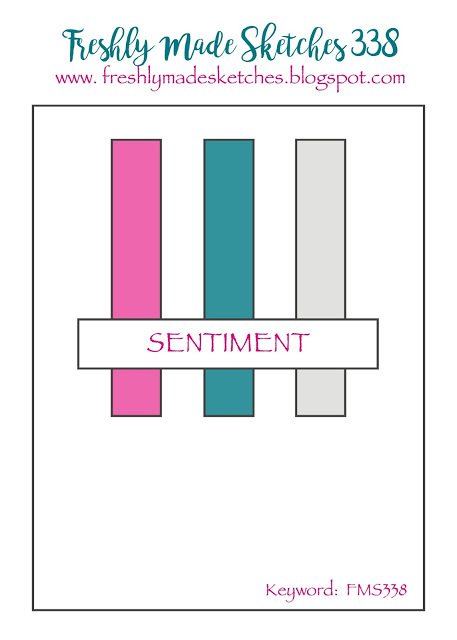 It just so happened that I had these colors out from the last few cards. 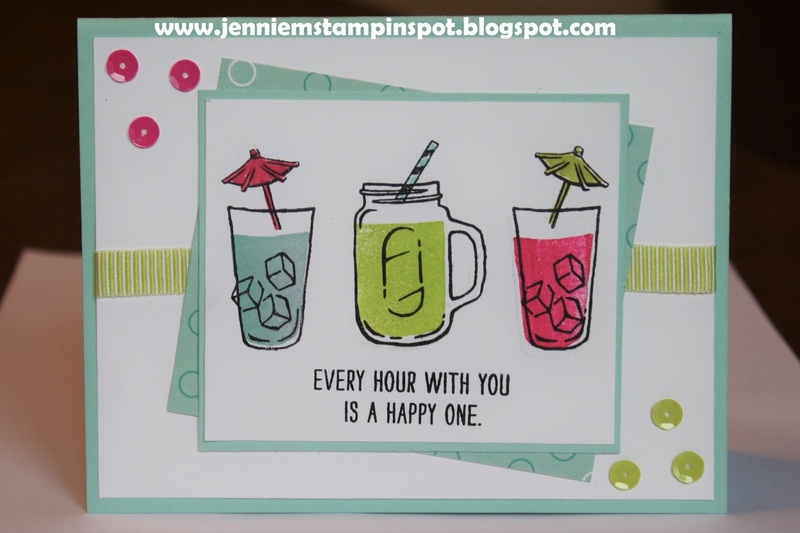 Mixed Drinks is the stamp set with some Picture Perfect Party DSP. 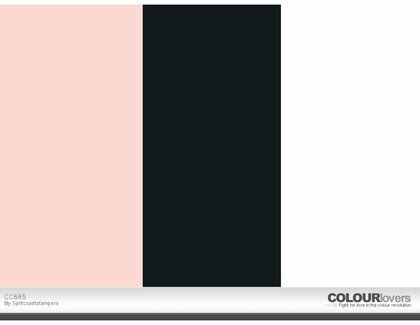 I came across another color challenge very similar to yesterday's post. 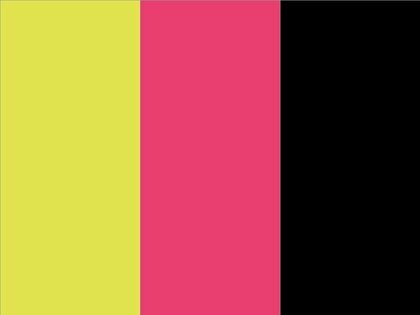 And I happened to have out most of these colors and papers. 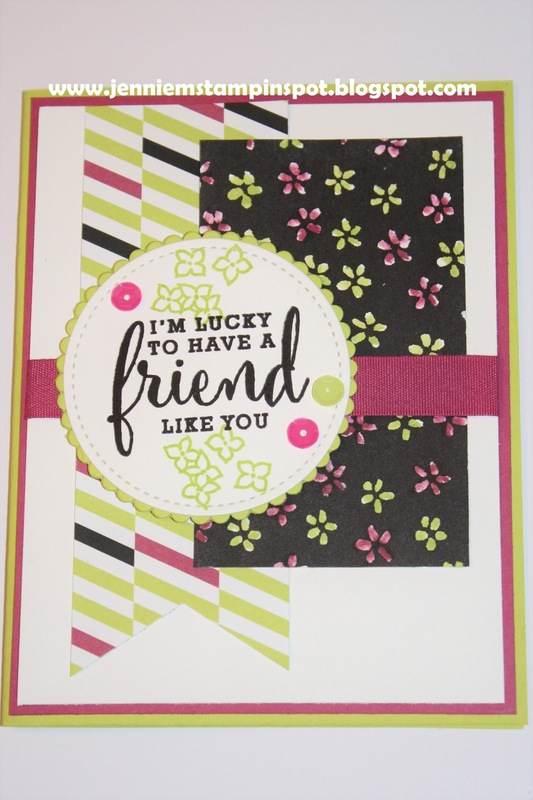 TGIF Challenge#158 here, is to use Berry Burst, Lemon Lime Twist and Basic Black. 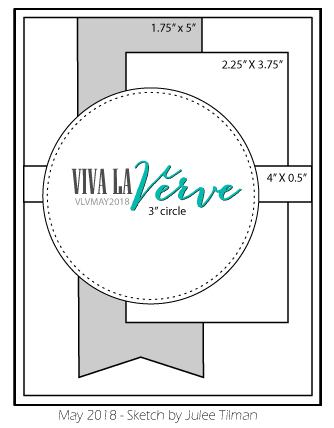 And I used the sketch at Viva la Verve May 2018 here. Love What You Do is the stamp set with some Picture Perfect Party DSP and some Petal Passion DSP. 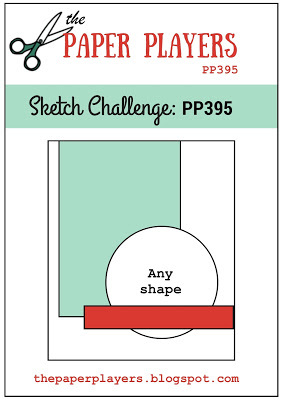 A favorite of mine is to combine challenges, and this one is for a sketch and a color challenge. 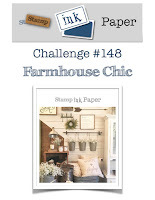 First, the sketch at Sunday Stamps#178 here. And then the colors are from Splitcoast Color Combination#686 here. The colors to use are Melon Mambo, Lemon Lime Twist and Basic Black. 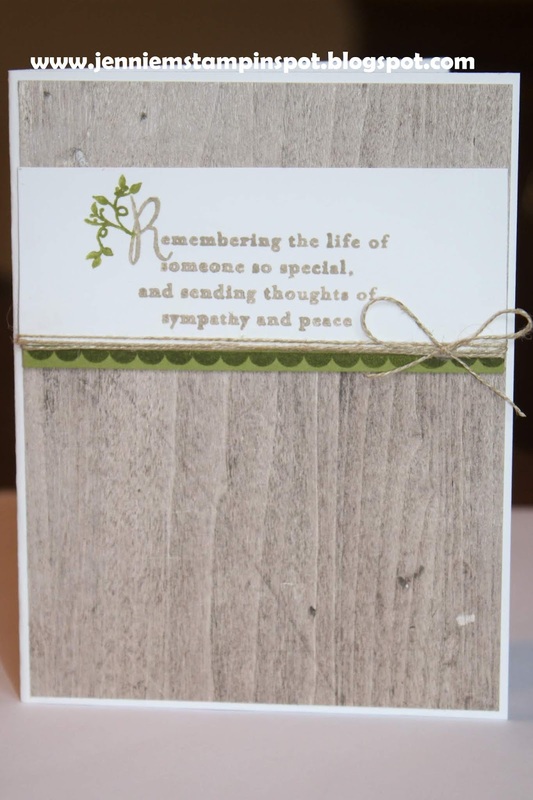 Flower Shop (retiring) and Thoughtful Banners are the stamp sets. Also used some Pick a Pattern DSP (retring). 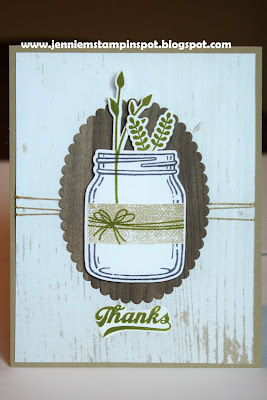 I'm back from a really fun wedding weekend and thought I'd send a thank you for including us! 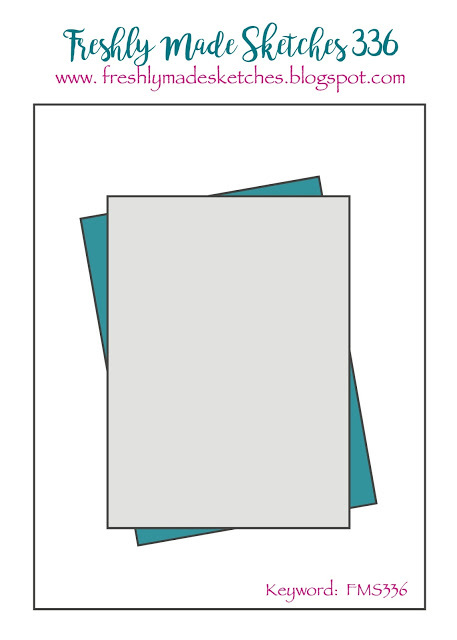 I used the Case this Sketch#270 here, and followed it pretty literally! 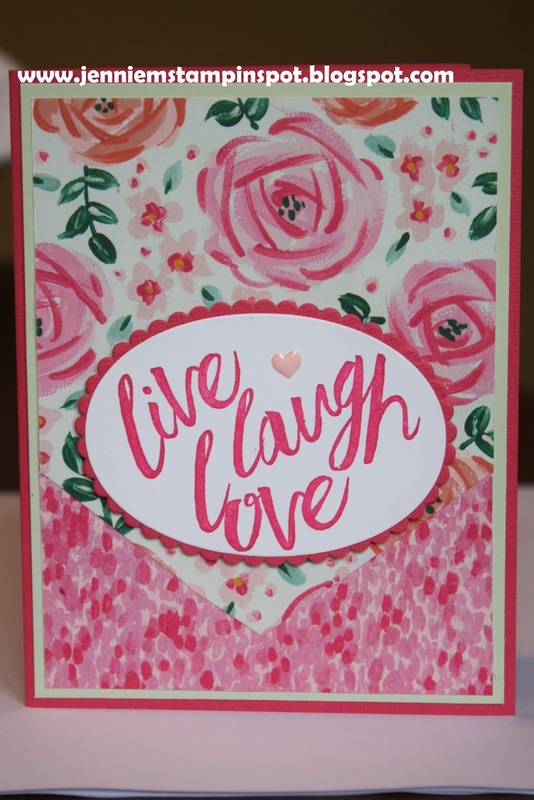 There are 3 new 2018-2020 In Colors on this card- Lovely Lipstick, Pineapple Punch and Blueberry Bushel. 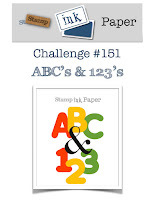 One Big Meaning is the stamp set, which is sadly going to retire. 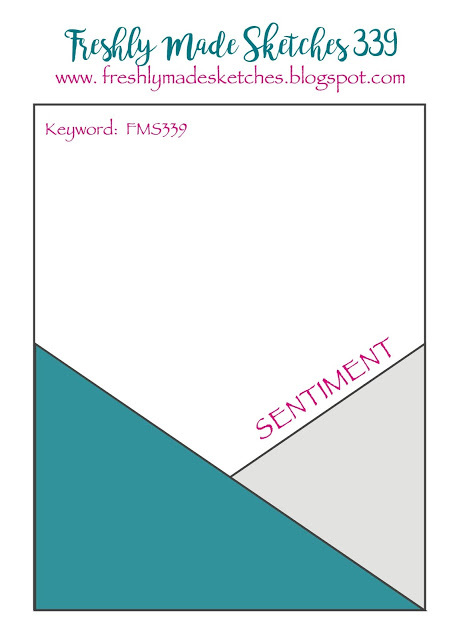 I also used the shape from Thoughtful Banners. 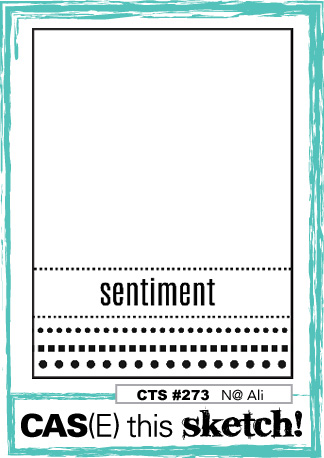 Here's a two-for Thursday card. First, the sketch is from Splitcoast Sketch Challenge#695 here. And second, the colors are for the Sunday Stamps#177-Nature's Colors, here. I chose to focus on the green, navy, crumb cake and white. 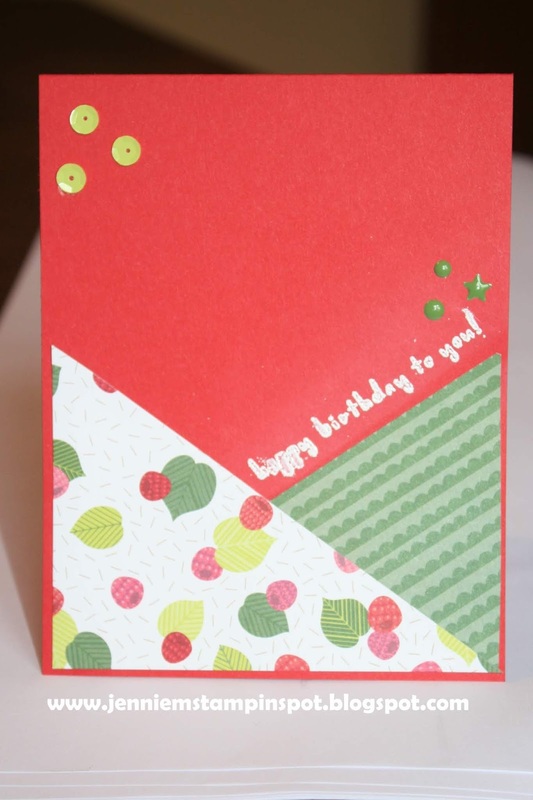 Fruit Basket is the stamp set with some Pick a Pattern and Tutti-frutti DSP (all going to retire). I also use the Marker flicking technique on the WW background to add some ink splatters. I hit the trifecta for this fun card-it's for three challenges. First, the sketch is for Freshly Made Sketches#335 here. 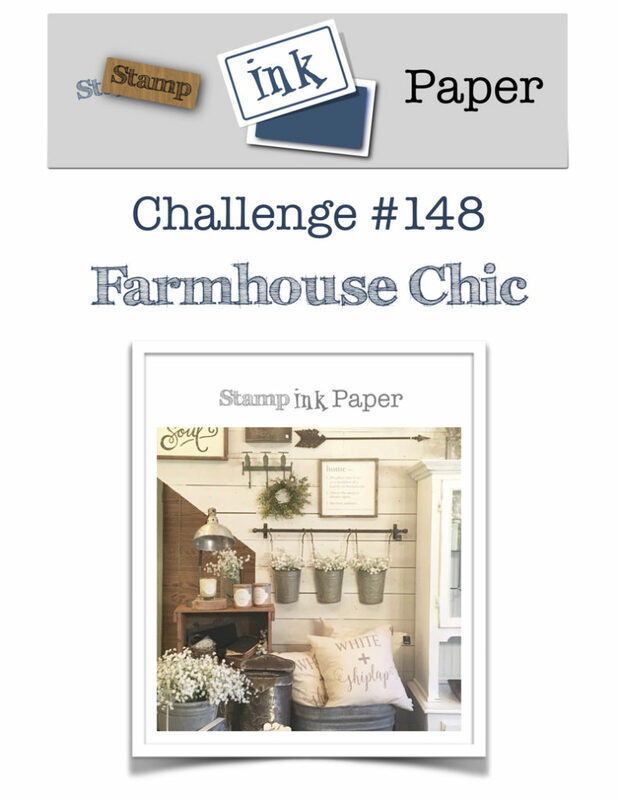 Second, it was inspired by the Stamp Ink Paper#148-Farmhouse Chic, here. And finally, The Paper Players#391-Tic-tac-toe, here. 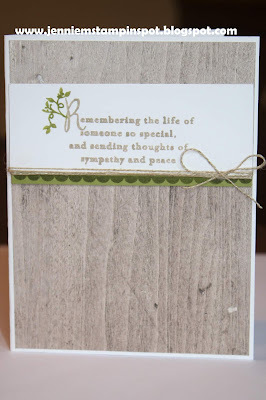 I went right down the top line with flowers, die cut and twine. Jar of Love is the stamp set with some Wood Textures DSP. 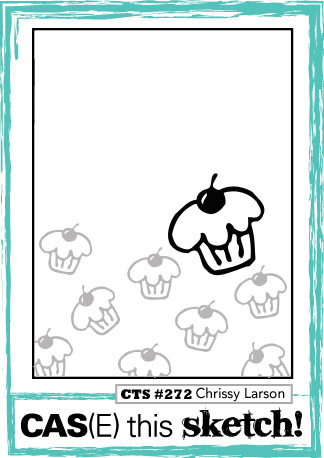 Here's another two for Tuesday card! 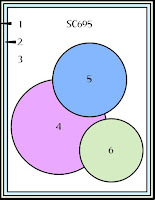 First, the colors are for the Splitcoast Color Combination#685 here. The colors to use are Pink Pirouette, Black and White. 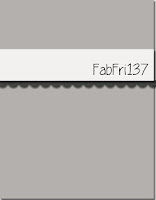 And second, I combined it with the TGIF Challenge#157-Tic-Tac-Toe, here. 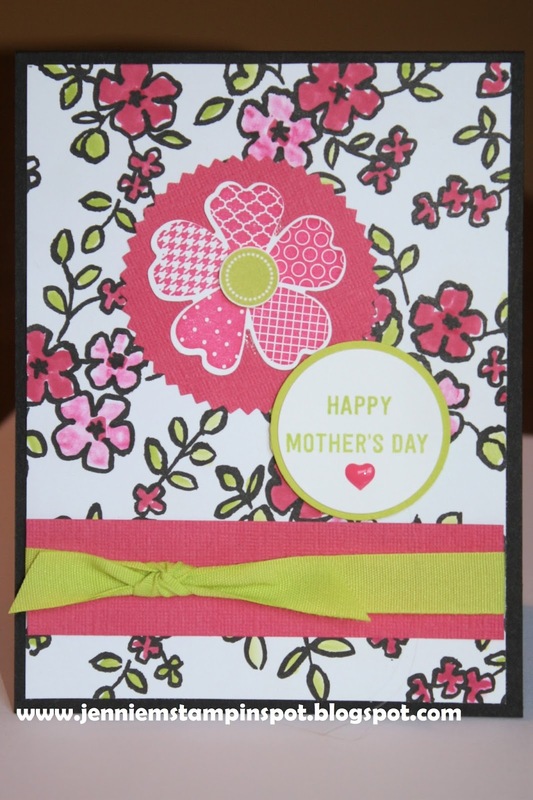 I went on the diagonal and used pink, paper piecing and tread. 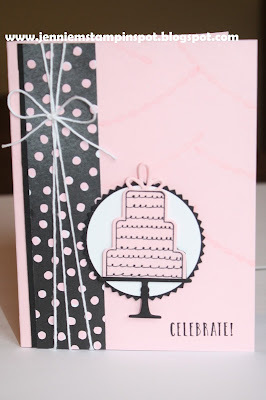 Celebration Time is the stamp set with its coordinating Celebration Thinlits. 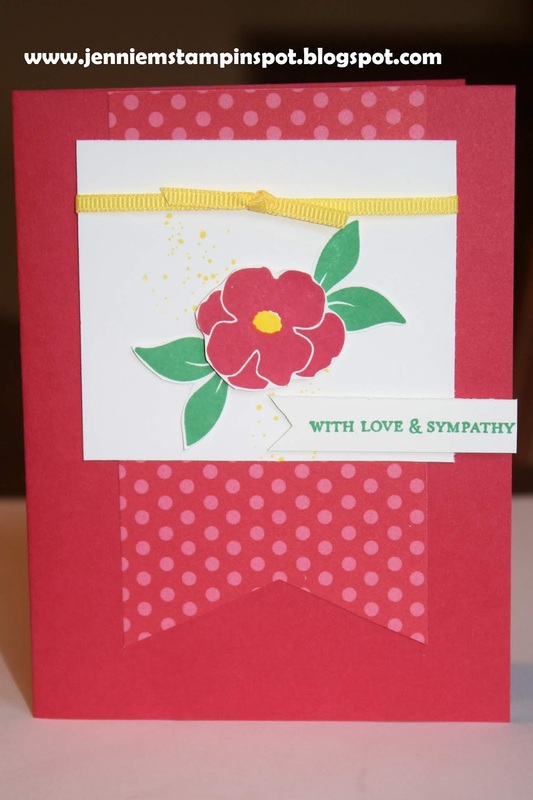 And I used some Petal Passion DSP. Get these goodies before they retire! Even Pink Pirouette is retiring!